As you read this, you may have already received a comprehensive understanding about the differences between DVD disc like DVD5, DVD9, DVD10 and DVD18. There are many DVD formats and this is actually based on the standard the manufacturer adheres to. Different manufacturer supports different standards and the situation is similar to the VHS tape wars. This is also known as the format war and the industry is eagerly waiting to see which format emerges as the industry standard. It is important to note that the different variations of the term DVD simply denote that manner in which the date is written on the disc itself. DVD-ROM was the first DVD standard that hit the market and it is a read-only format. Basic nature It is a single sided single layer disk. It is a single sided dual-layer DVD disc. It is a double sided single layer DVD. It is a 2 sided disc that holds DVD-9 on both sides. Here two layers of standard DVD-5 are joined together with a transparent spacer. Capacity It can store 4.7 GB. It can contain up to 8.5 GB or 7.95 computer GB. It can store up to 9.4 GB or 8.7 computer GB It can contain up to 17 GB or 15.9 computer GB. It holds 8.5 GB. DVD formats It is supported by DVD+R/RW & DVD-R/RW formats. Supported by DVD+R & DVD-R formats. Supported by DVD+R/RW &DVD-R/RW formats. DVD+R format. DVD+R & DVD-RW. Play features Can be used on DVD-ROMs & DVD burners. Can be used on DVD-ROMs & DVD burners. Can be used on DVD-ROMs & DVD burners. These formats are supported by big brands like Philips, Yamaha, Ricoh, Dell & Hewlett-Packard. DVD+R is similar to CD-R as it is a recordable format. It can record the data only once and then the data becomes permanent on the disc. These cannot be recorded for the second time. DVD+RW is a re-recordable format which is very similar to CD-RW. The data can be erased and recorded many time without causing any damage to the medium. It is important to not that DVDs which are made with the help of a +R/+RW device can be easily read by most of the commercial DVD players. 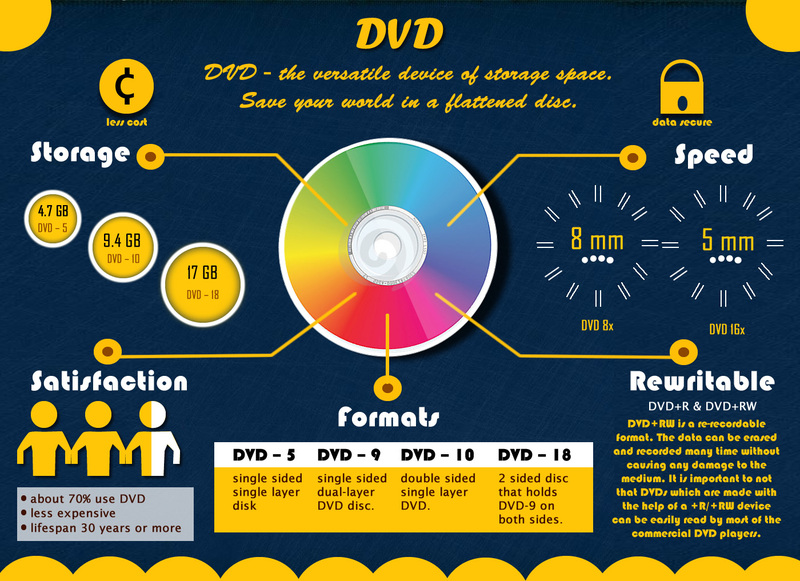 DVD 5 or DVD 9: When do you use each? It goes without saying that DVD 5 and DVD 9 are the two most popular formats of DVD. But the choice of format is very much dependant on the source movie. If the source has a high bitrate then a high amount of compression will give much better results than a movie with a low bitrate. The DVD 5 format is mainly used for movie titles and to reduce the amount of compression, one can easily remove the end credits. DVD 9 is generally used for those movies which use a lot of interactive menu and the TV series which normally has around 7 episodes per disc.